Back to Motion is always looking for ways to help you keep fit. With so many exercise options it might get confusing, we wanted to show you solid fitness routines. There are many viable ways to increase strength and fitness but often, time is the limiting factor. 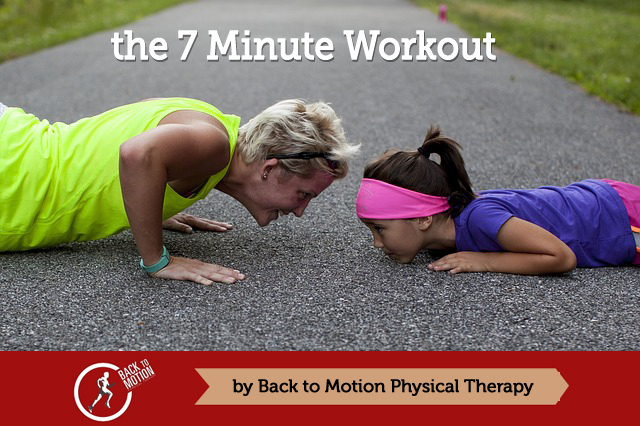 The 7 Minute Workout may be the answer to the time dilemma stopping you from achieving your fitness goals. The 7 Minute Workout was developed by two exercise physiologists at the Human Performance Institute in Orlando, Florida. They combined high intensity circuit training with 12 exercises that are a combination of aerobic and strengthening. The only equipment needed is a wall, a chair… and 7 minutes. Each exercise is performed for 30 seconds with a 10 second rest. To increase the workout you can repeat the routine as many times as you like or add small weights. The combination of aerobic activity and body weight strengthening has been shown to be as effective as a 20 minute aerobic or strengthening session. Need a reminder and a timer? Follow along! Confused about how to do the exercises? Here are all 12 exercises performed by the pros. Jumping jacks are a great warmup. Heres how to do the perfect jumping jack. Wall squats or wall sits are great for the lower body. Remember to hold this for 30 seconds with a 10 second rest. Pushups are sometimes hard for women. Here are some variations on the pushup. Situps are not all created equal. Crunches done slowly are more effective. Make sure to use a sturdy chair and be in a place were falling isnt likely. Squats are often done incorrectly. Heres how to do squats the right way. Get a better arm workout with tricep dips. Start that cardio with running in place. Lift those knees. Heres how to do a proper lunge, BIG step. If you dont know what rotations are, here it is. Also includes a variation if theyre too hard. Last One, the Side Plank.